Climbing and Access information for this 11er peak is found on page 270. Two route descriptions are set out below for the north ridge. The first accesses the ridge from Mahogany Creek and the second, from Rock Creek. 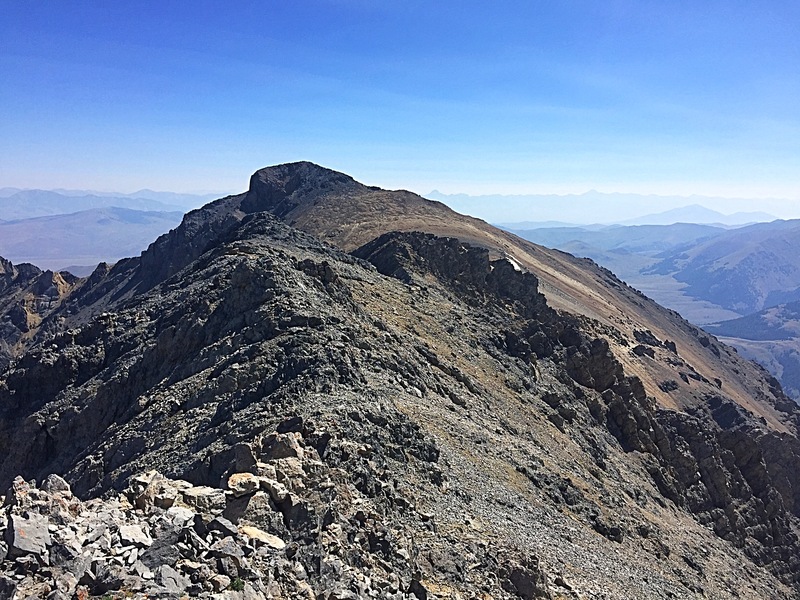 This big peak, the 23rd highest in Idaho, is located north-northeast of Mount Borah. It is connected to Borah by a tortuous ridge. 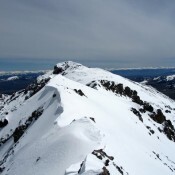 Mountaineer Peak is seldom climbed and not easily approached. The summit is protected by arduous talus and imposing cliffs. Mountaineer Peak viewed from Mahogany Trident. The USGS topography map does not show the main approach road, FS-318, but it does show up on USFS maps. FS-318 is a 4WD road that penetrates deep into the Mahogany Creek drainage and leads nearly to the east ridge of Mahogany Trident. 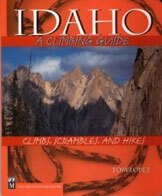 Access the peak from FS-267, the West Fork Pahsimeroi Road (C)(3.1) on page 293 of Idaho A Climbing Guide. FS-267 leads up and over hills and ridges on the north side of Mahogany Creek to 8,700 feet. Here, the road becomes extremely steep and eventually dies out around 9,100 feet. There are several fair campsites along the road. Follow the road to 8,600 feet and park. As noted in the book, this route can also be accessed from the west via Rock Creek [(C)(1), page 293]. I recommend the Mahogany Creek access as outlined above. From the parking spot, contour southwest through the forest and pass Point 9012 on its north side. 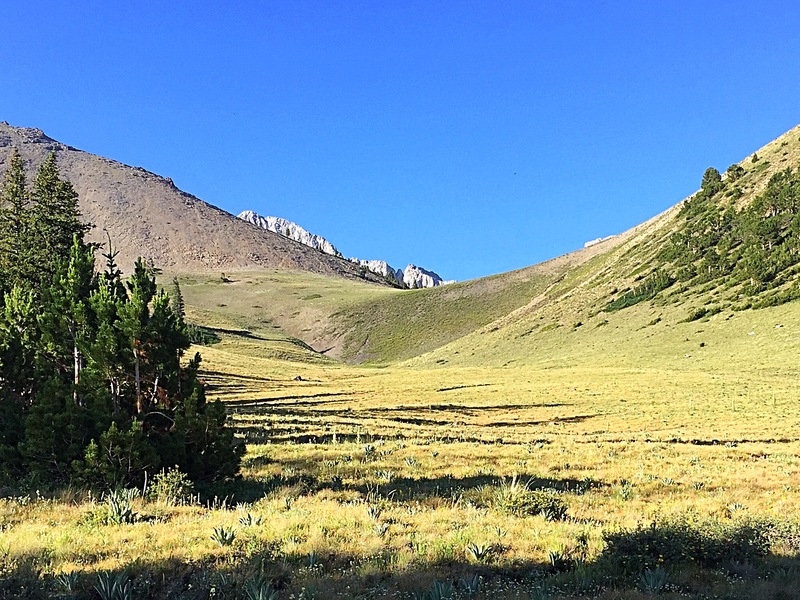 Here, you enter a giant meadow that you can follow all the way to the 9,482-foot pass on the peak’s north ridge. 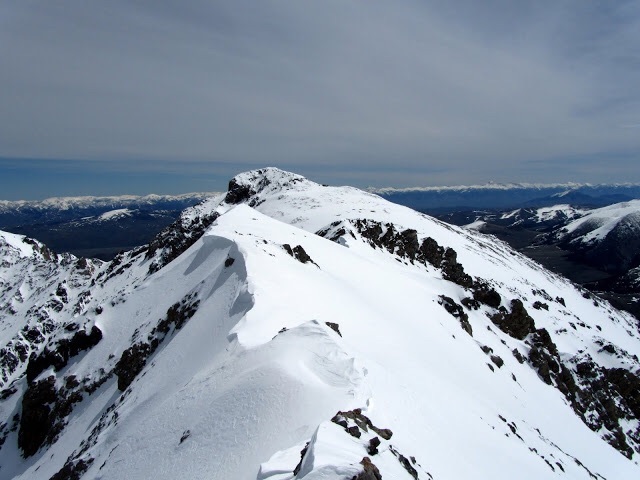 Once on the ridge, follow the game trail to the 11,715-foot false summit, which is 0.6 miles west of the true summit. There are two rock ribs on the connecting ridge. These obstacles can be surmounted via easy Class 3 climbing. 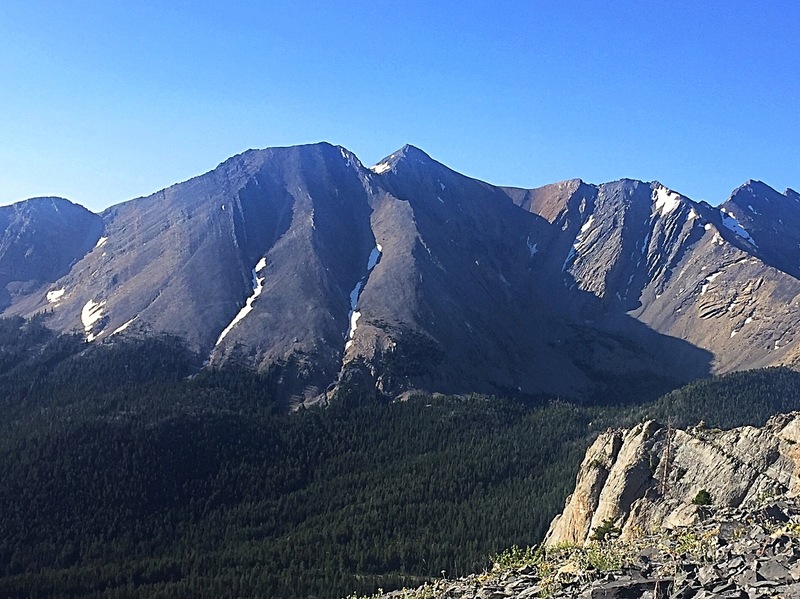 On our return to Mahogany Creek, Pat McGrane and I hiked a route of steep talus and skirted cliffs from the saddle that separates the true summit from the false summit. In doing so, we crossed 200 feet of Class 3 and 4 rock to avoid a steep snow gully, which required an ice axe and crampons to descend. In hindsight, we should have reversed our approach route rather than chosen this more difficult descent…because our ice axes and crampons were back at camp. The 9,482-foot pass at the head of Mahogany Creek. The north ridge climbs up toward Point 11715 on the left side of the photo. Borah’s North Face from the north ridge on Mountaineer Peak. The route climbs steeply out of the pass and then crosses a long, less steep section between 10,000 and 11,000 feet. Above 11,000 feet the ridge climbs steeply to Point 11715. Looking east from Point 11715 to the true summit. 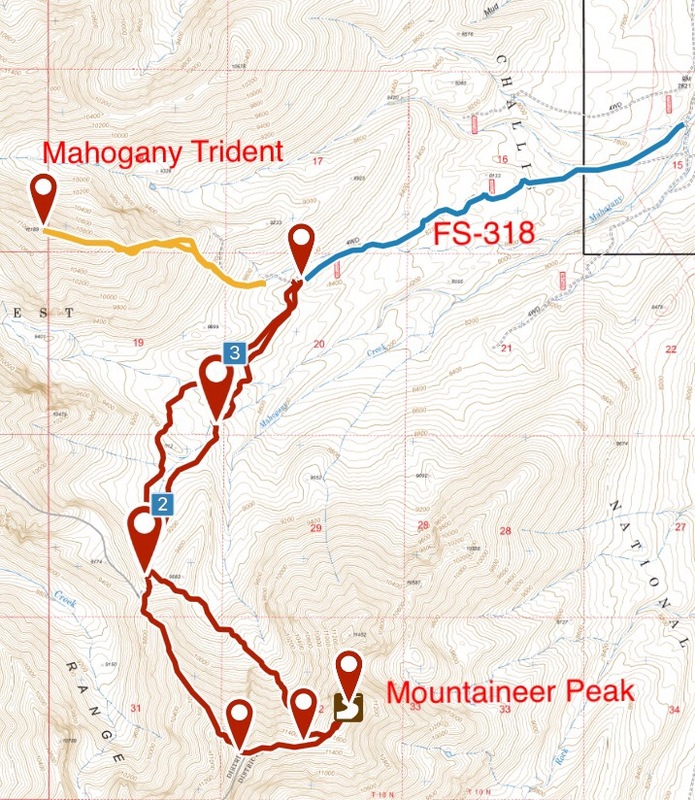 This map shows the access from the Pahsimeroi Road into the upper reaches of Mahogany Creek and our routes to Mahogany Trident and Mountaineer Peak. The descent route from Mountaineer Peak’s northwest face is not recommended. 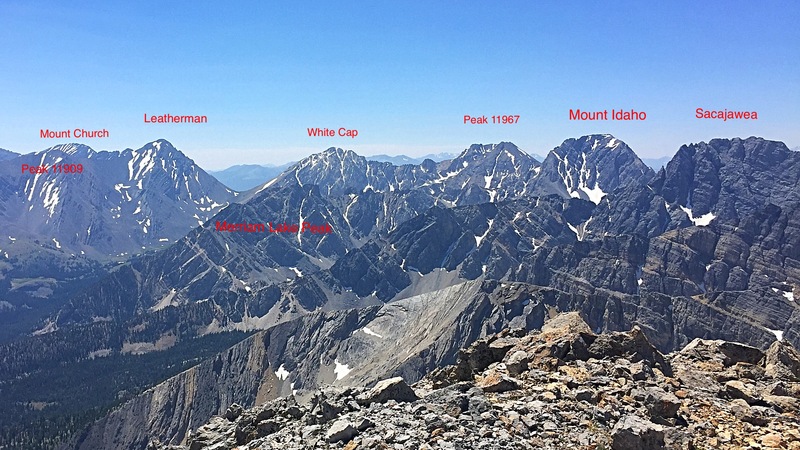 The main Lost River Range crest viewed from Mountaineer Peak. The footing along the route is surprisingly good. Nevertheless, with good snow conditions covering the talus the route might be a little easier. Mountaineer Peak viewed from Point 11715 in June. George Reinier Photo. Rock Creek Road [(C)(1)]. Please note that the road description for Rock Creek Road (page 293) actually describes the “baseline road” that runs along the base of the mountains from the earthquake information center on Doublespring Pass Road all the way to the Borah Peak Trailhead area. It does NOT lead you to Rock Creek Canyon. You must turn off of the “baseline road” onto the true “Rock Creek Road” to reach Rock Creek Canyon. Sometimes these baseline roads become rutted or otherwise impassable due to the multiple gullies that they inevitably must cross. If the “baseline road” is in poor condition or if private property access issues become a problem, there is an alternative road that will get you to Rock Creek Canyon. Also, there are three different roads that all emanate from the earthquake information center area on Doublespring Pass Road (within 0.5 mile of each other) to confuse you. If you mistakenly drive on the wrong road, you won’t get to Rock Creek Canyon or anywhere near it. Save yourself some headaches by taking the alternative approach detailed below. It is easily accessed from Highway 93 and aims itself directly at Rock Creek Canyon. It is the REAL Rock Creek Road. From the junction of Highway 93 and Doublespring Pass Road, drive 0.3 mile northeast on Doublespring Pass Road. Turn right/east onto an unmarked two-track road that runs along the north side of a fence row. Set your odometer to 0.0; this is the REAL Rock Creek Road.Turn left at 1.3 miles. Go straight at 2.0 miles and again at 2.6 miles. Turn right onto a gravel spur at 3.0 miles. Reach a parking area at 3.2 miles. Park here (7,165′). The final section of the road is gravel and drops to Rock Creek and the diversion dam, but there is no parking available at the end of the road. It is about 0.2 mile from the parking area. From the Rock Creek parking area, hike 0.2 mile on the gravel road to the diversion dam at Rock Creek. Cross the diversion dam and scramble up onto a steep sagebrush buttress on the south side of the creek. Bushwhack through a short, wooded area and into another open field. Drop 20 feet to glacial boulders near the creek and find a good climber’s trail here. Follow this excellent trail up through the wonderful open pine forest to a flat area at just above 8,800 feet. Bushwhack across the creek (which is now a very small stream) then up a small gully. 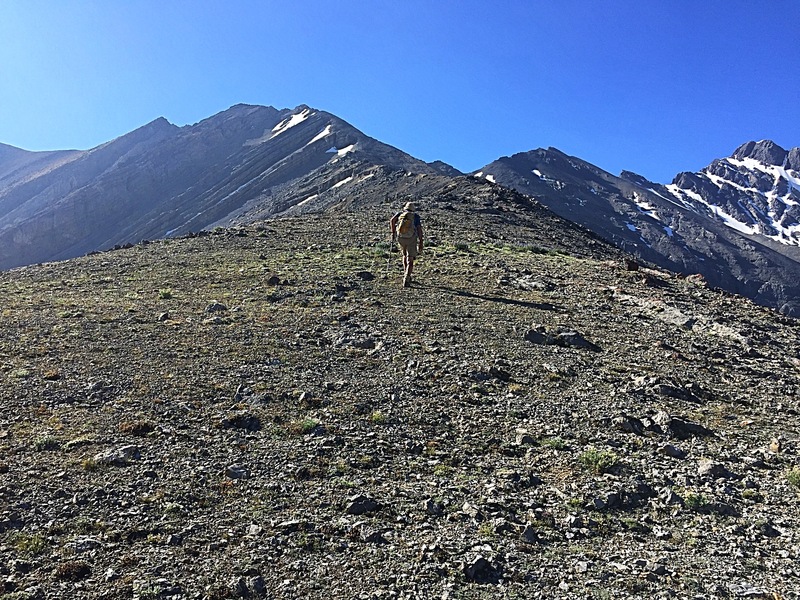 To make your life easier, use game trails in the scree on the side(s) of the gully that lead up to a 9482-foot saddle at the base of the North Ridge of Peak 11828. 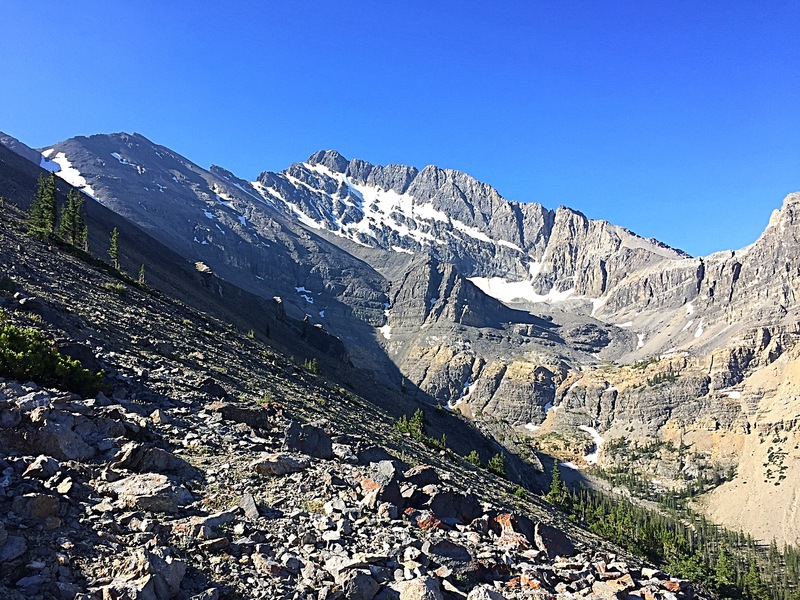 From the gentle, grassy saddle, plod southward up the ridge on loose scree to reach [firmer] rocky outcrops and nice blocks of slab rock, finding a climber’s trail on-and-off on the ridge. 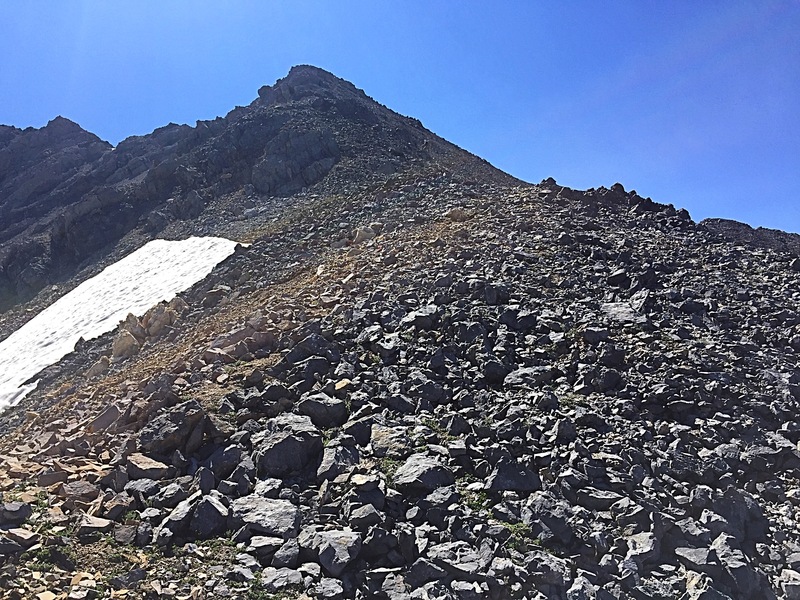 Nice view of Borah Peak’s north face from this section of the ridge climb. Continue up the ridge on firmer rock and scree to reach the rocky false summit (Point 11715). The ridge turns left/east here. Scramble up over a ridge bump then down to a glacial gravel saddle on wonderful chip-rock. Finish the climb up the ridge with a 330-foot scramble northeast then north up crumbly rock to reach the summit. The ups and downs from Point 11715 to the 11828 summit are as follows: Down 110 feet, Up 60 feet, Down 160 feet, Up 330 feet. The [unexpected and good] climber’s trail on the south side of Rock Creek made this adventure much easier than it otherwise would have been. Please be aware that the climber’s trail spends most of its time in a wonderfully-open pine forest, well above the creek.